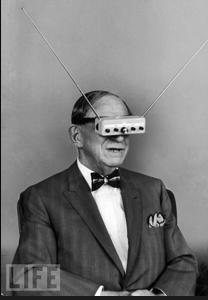 As we adjust our necklaces of garlic, we might spare a memorial thought for Hugo Gernsback, a Luxemborgian-American inventor, broadcast pioneer, writer, and publisher; he died on this date in 1967 at the age of 83. Gernsback held 80 patents at the time of his death; he founded radio station WRNY, was involved in the first television broadcasts and is considered a pioneer in amateur radio. But it was a writer and publisher that he probably left his most lasting mark: In 1926, as owner/publisher of the magazine Modern Electrics, he filled a blank spot in his publication by dashing off the first chapter of a series called “Ralph 124C 41+.” The twelve installments of “Ralph” were filled with inventions unknown in 1926, including “television” (Gernsback is credited with introducing the word), fluorescent lighting, juke boxes, solar energy, television, microfilm, vending machines, and the device we now call radar.